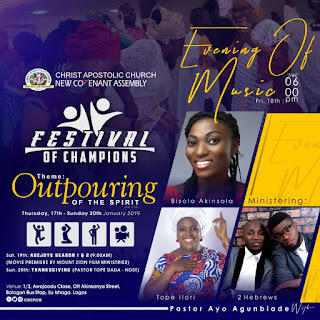 Christ Apostolic Church, New Covenant Assembly, Iju-Isaga Lagos has unveiled plans for 2019 edition of her annual "Festival of Champions" programme. 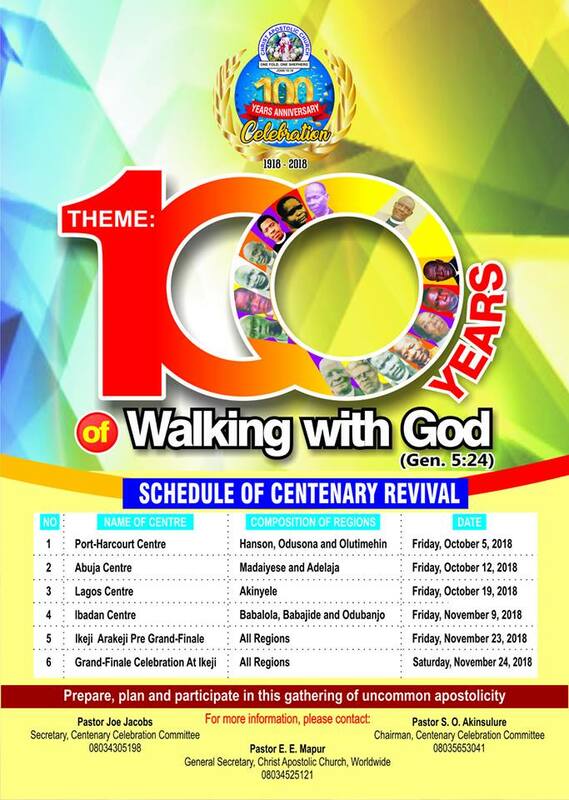 The programme which is in its 9th edition will hold from Thursday 17th to Sunday 20th, 2019 with the theme "Outpouring of the Spirit." We gathered that the Assistant Youth Coordinator of CACYOF Akinyele Region, Pastor I.D.O. 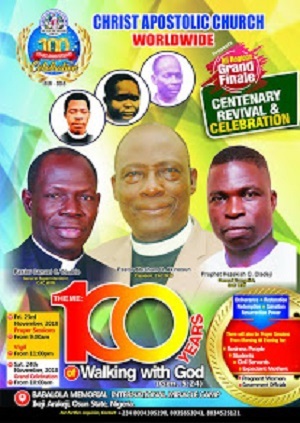 Akinyele will deliver a lecture on Thursday 17th January, 2019 to start this year's edition of the annual spiritual fiesta. "Evening of Music" will hold on Friday 18th January, 2019 by 6pm. 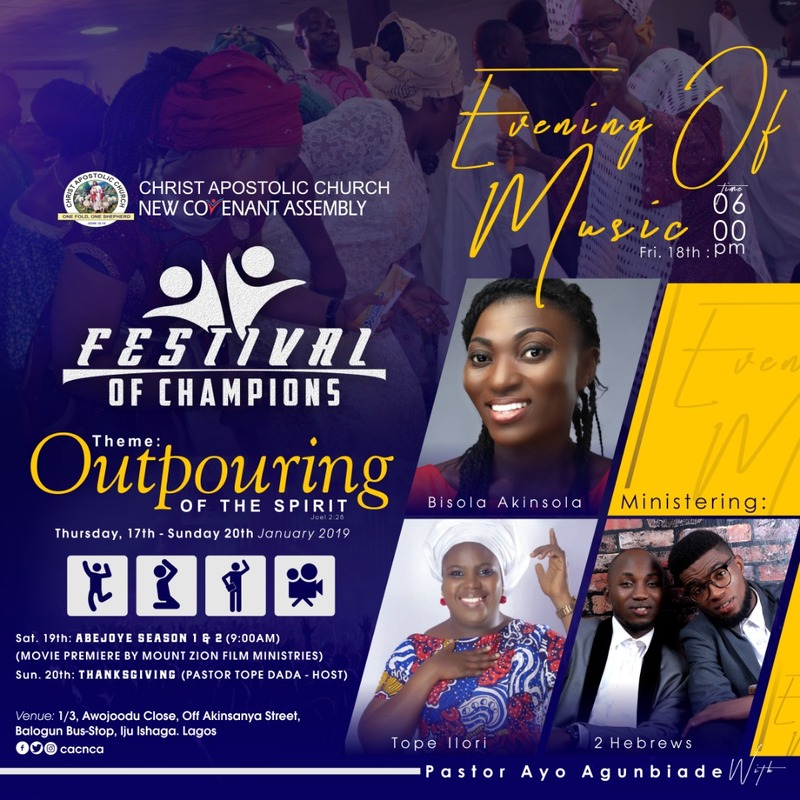 Renowned gospel singers like Tope Ilori, Bisola Akinsola and 2 Hebrews are expected to thrill the congregation with their powerful and inspirational songs. 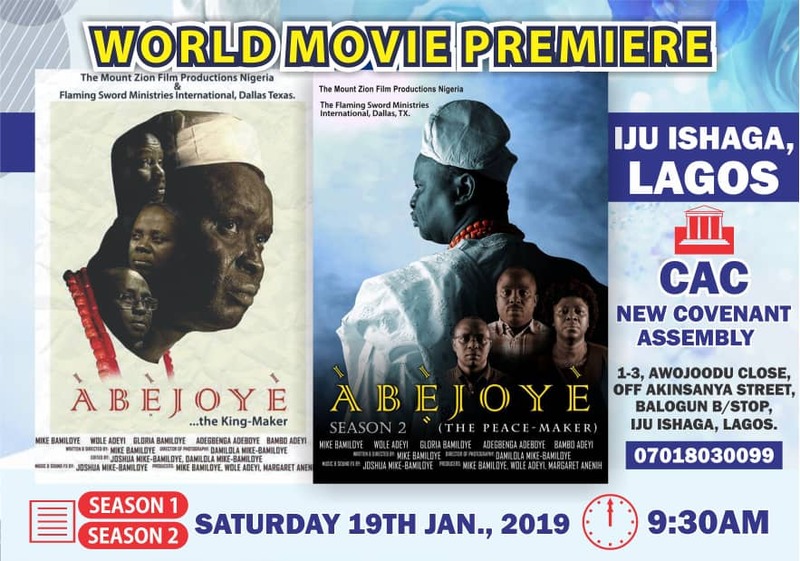 Festival of Champions 2019 will take a new dimension on Saturday 19th 2019 with the movie premiere of "Abejoye Season 1&2" by Mount Zion Film Ministries by 9am. 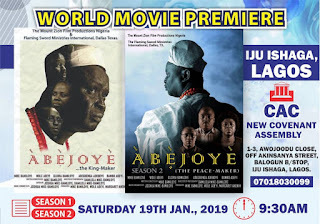 The grand finale of Festival of Champions 2019 will hold on Sunday January 20th by 9am. The Music Director of CAC Worldwide, Pastor Tope Dada is the host. CAC NEW Covenant Assembly is situated at 1/3, Awojoodu Close, off Akinsanya street, Balogun bus-stop, Iju-Isaga Lagos. Wow! I can't afford to miss this awesome experience. I will be there by God's grace!